Get into the Holiday Spirit! When leaves change colors, and temperatures cool, it means the holiday season is right around the corner. What better way to greet the coming celebrations than with a colorful garland on your mantelpiece or across your piano? Beautiful Colors to Cheer Up Your Home If you're looking to spruce up the entryway, add some holiday color to the centerpiece on your dining table, or brighten up those stair banisters, the CraftMore 6-foot Berry Garland has all that you need to make this holiday season lively and joyful! Make this holiday season colorful and bright in your home. Get a Berry Garland today by clicking 'Add to Cart' above. WONDERFUL COLORS - The vibrant red berries will add a great splash of color to any room, display, or project this season. VERSATILE - Whether you only need 6 feet for the mantel, 12 feet draping over a doorframe, or 24 feet for the stair banisters, this garland has you covered. Just use multiple garlands together to create the length you need. GREAT FOR ANY SPACE - This garland is the perfect way to accent your home and style this holiday season, and it's ready any occasion. DURABLE - This garland can stand the test of any home and will bend to any shape for your decorating needs. 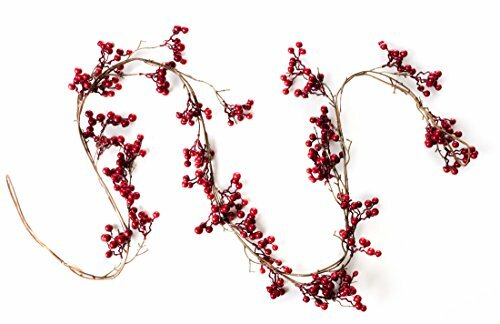 SATISFACTION GUARANTEE - Each order of our CraftMore Berry Garland comes backed with a 100% money back guarantee for satisfaction. If for any reason you don't feel that this is the best Berry Garland available, contact us for a full refund.